I like to cook a lot of foods from scratch, and back when we had 3 or 4 growing and constantly hungry children underfoot, I spent a lot of time at it. At one stretch, we even grew many of the ingredients ourselves. This meant I had acquired a lot of kitchen gadgets, many tools to do different things to make the process of getting the vegetables to the table easier. Over the years, the kids have grown up, our needs have changed, and many of the neat kitchen gadgets and weird tools have been cleaned out. there are some, however, that I’ve kept – even though I use them once a year or less. I have a pasta maker I whip out for special occasions – and they have to be really special, because taking 3 hours to make homemade ravioli that disappears in less than 15 minutes can be a little daunting. I also have a tomato strainer. It’s large, has many pieces, and the box frequently gets in the way unless I keep it on top of the fridge. But keep it I do. Why? Well, once a year, maybe two, we either grow, buy, or get gifted with more tomatoes than we can handle or even eat in a week. And our family loves tomato sauce. Yes, you can buy tomato sauce cheap, and we go through a lot of it. But until you’ve tasted fresh homemade sauce, you have not truly tasted tomato sauce. The way this machine works, it gets the whole family involved. Someone clamps it to the table and put the thing together, someone starts quartering tomatoes, and one of the kids starts tossing the pieces in and turning the crank. Seeds and pulp come out one end, and beautiful crushed tomatoes come out the other, right into the pot. Then I give it a simmer, add spices and there we go. Underlying all this is a process that highlights where something comes from. It’s easy to buy a jar or can of tomato sauce. 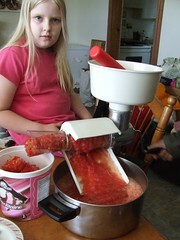 It’s harder still to grow the tomato, process it and make the sauce yourself. My tomato machine helps me in that. But mostly it helps me, and the children, understand how involved that final product came to be. And today that got me thinking about WordPress. Sure, I could hand-code an entire website in HTML – and I’ve done so. It takes an enormous amount of time. WordPress, on the other hand, is like my tomato machine. I set it up and just.. crank. There are other tools I’ve used in my work life that also make my job easier. Sometimes I go back and do things the hard way, just to keep my skills sharp. Yesterday, I coded. I could have asked Ron to do it for me. And he could have done it in 20% of the time it took me to do it. But I wrote that function so I could still remember how to write a function, and thus get better at explaining it to others. Even if it was a really simple 3 line function. (Two of them, in fact. Go me!) I had tools at my disposal like the codex and forums to help me. What kind of rarely-used tools do you have that can make your work easier? Even on tasks you don’t do that often? What tasks do you do occasionally to keep your work brain sharp?